The author would like to thank Ms. Patricia S. Markley and Professor Allen Tough for their insightful comments on early drafts of this presentation, and Dr. Tae-Chang Kim for his visionary ideas regarding multi-media and the Internet which it recommends. This is an exercise in "visionary futures exploration" - the use of imagination and intuition to discern transformational future possibilities and their implications for present-day values, attitudes, policies and decision making. A "guided cognitive imagery" script is presented which, when read aloud, takes the hearer on a journey to different time periods, both past and future. The journey ends by having the participants first scan back across all the time periods they visited, so as to get a more global sense of perspective on what is truly most important; and in response, to imagine sending a message from the future back to the present regarding, "What future generations need from us. " It is recommended that the Future Generations Alliance Foundation help make a multi-media version of this and similar exercises available on the Internet as a way in which many different types of participants could share and discuss their responses. It would be a new and radically participative approach to "future generations" research, communication and education. What if we were able to look at our present place in human history from the vantage point of future generations? What would we find most important about this particular era in human history? If we had the hindsight of "future history" to guide us, what changes in underlying attitudes, behaviors, laws and policy would we suggest as being wise - or even imperative - in order to minimize the likelihood that future generations will inherit a world that has in many ways been ruined by those who came before? This paper offers a way to do this. It presents a script for an experiential "guided cognitive imagery" exercise which takes the participant on an imaginary journey through various times and places in human history past and future. 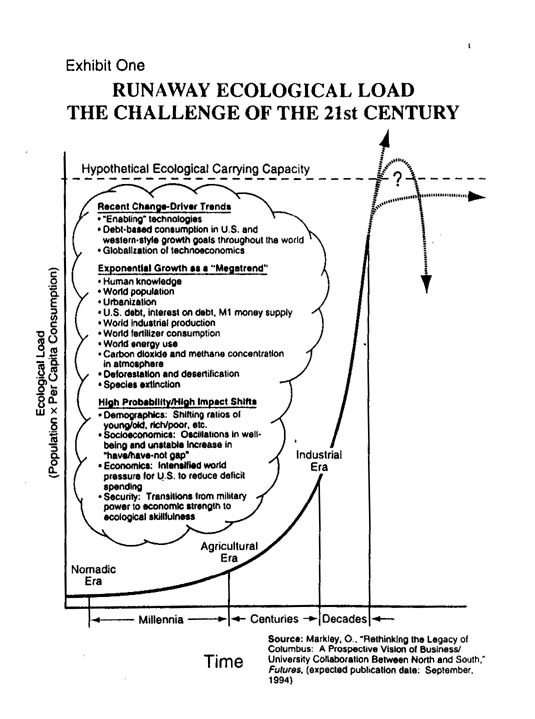 The thematic focus of the guided imagery journey is the exponential increase in "ecological load" that can be seen as occurring across the major epochs of human history, and which threatens to overtake the ecological carrying capacity of the planet, with drastically negative consequences for future generations if it long continues. Ecological load may be visualized as comprising all the impacts that are flowing from overall population times per capita consumption (especially consumption of "non-renewable" resources). Exhibit One depicts a graphical view of this ecological load theme in a way which summarizes many of the trends and emerging issues that need to be appreciated and responded to by leaders, students, and other citizens. In some situations, it may be good for participants to hear about and/or to discuss materials such as Exhibit One before engaging in the guided imagery exercise which follows. It is suggested that the following script be read "as is" as a way to help a group of people experience significant needs of future generations. When doing so, please ignore the bold-face section titles and be sure to read slowly, with long pauses when appropriate, to allow for the inner experience of participants. Imagine that you are a student in school. Your teacher is lecturing about history, hoping that you will learn something about the management of social change at different times and places on this spaceship home we call "Planet Earth." Imagine that right now the teacher is describing the very beginnings of civilization ... a time when some nomadic tribes who lived by hunting and gathering were facing great difficulty. Because of climate shifts, the types of plants and animals they depended on for food were often no longer where they expected to find them. So ... many of these peoples had to figure out how to respond, if there were to be any future generations coming after them. O.K. Now imagine that your teacher has changed the topic of the history lecture, and is now talking about how the nomadic tribes eventually learned to domesticate animals, to harvest plants from seeds they sowed, and to even build villages - things that made it seem possible for the tribe to survive in one place indefinitely. But with the coming of modem technologies, the simple ways of traditional village life are giving way to the complexities of large cities. So your daydream shifts, and you find yourself in the same region as in the first daydream, but many thousands of years later; at a time when the impacts of colonialism are being felt in all parts of the world and traditional indigenous village life is giving way to the ways of industrialized society. Imagine that you are now an elder in a traditional village who is concerned for the future of your people. Scene Three: The Short-Range Future - facing "limits to growth"
Your teacher has changed the topic once again, and is now talking about how the spread of advanced technologies all over the world has led to exponential growth in population, pollution, resource depletion and other things which, if they continue to grow, will exceed the very carrying capacity of "Spaceship Earth" - both for human civilization and for other important species which together spring forth in this planetary nest. While your teacher continues to lecture about the future, your daydream jumps ahead still further, to about 200 years, or eight generations into the future: the year ____ (e.g., 2197 - please write this date in the script before leading the exercise with a group). If current forecasts prove at all accurate, this is a time in which things are becoming decidedly clear - one way or the other - how the whole issue is turning out regarding humankind overrunning and despoiling much of the ecology of the planet. In your daydream you find yourself alive here in the world of ____ (date). You are able to sense what it is like here, and what type of life you have. As you begin to be aware of this, What do you notice first? ... What is the ':feel" of life here? ... What actions by previous generations made things turn out this way? ... How do people in this time and place go about guiding what the society is about? ... What do they do to find the answers they need? Given what you now see about human history, both past and future, if you could send a message from the future back to the present, so as to communicate what future generations most urgently need from us, what would that message be? ... Now you may imagine that the teacher has ended the history lesson. ... So you return from the daydream that you have been experiencing, and return your attention to the room where you are sitting, ready to write down or to share what you have experienced and learned just now. After leading a group using the above script, it is useful to provide enough time for participants to share what they experienced with others in small "buzz groups" of two or three. Surprisingly, this can even be done successfully in a large auditorium with theater-type seating. People are usually quite conducive to sharing their experiences, even with strangers. And if you are interested in collecting data on this, you can have them fill brief survey forms that you give them. Please note that ethical concerns regarding this type of exercise may exist for some who question the appropriateness of a guided imagery exercise designed to create points of view likely to be quite at variance from the "official" viewpoints currently held by most political leaders. For this reason you may wish to have participants discuss this possibility. Do participants who have experienced it view this exercise as an "appropriate technology" for use in schools and other social settings? If not, why not? What needs to happen instead? Whether or not you have participants share their experiences in small groups, it is useful to provide an opportunity for a few participants to share with the whole audience their answer to such questions as: "What did you find most surprising in this exercise?" and, "What answer did you get to the question: What do future generations most urgently need from us?" In order to fully appreciate this exercise, and to be a good facilitator for others, it is necessary first to experience it for yourself. An excellent way to do so is to pre-record it on a cassette tape recorder, and then to play the tape back, experiencing it as a participant, not as a guide. Among other advantages, this will give the inexperienced guide a direct lesson in timing, how important it is to read the script slowly, and with what otherwise might seem like overly long spaces of time during which the participants actively imagine, which, after all, is the whole point of the exercise. It may be worth noting that the above script is based on methods I developed when a futures researcher at the Stanford Research Institute (now SRI International) and which I currently teach in a graduate "Visionary Futures" course at the University of Houston-Clear Lake. This script was adapted from a similar guided imagery exercise which I have used dozens of times over the past 20 years with all types of audiences: small and large, from students to professionals, and with all types of education and background. It is easy and safe to use, and often provides participants with a deep-seated change in viewpoint and values that may be characterized as "global consciousness." I strongly encourage others to create guided imagery exercises on what future generations may need, and the short bibliography which follows was selected with this in mind. I hope that the exercise described in this article will inspire significant increases in global consciousness for participants in all parts of the planet; and that it will also stimulate the creation by other "Visionary Futurists, " of their own guided imagery vehicles for "re-visioning" the human future. Due to the inspiring leadership of its founding Chairman, Mr. Katsuhiko Yazaki, and the strategic vision of its President, Dr. Tae-Chang Kim, the Future Generations Alliance Foundation is in a position to make available on the Internet a multi-media version of this and/or subsequent exercises (featuring both a pre-recorded audio track and full graphics capabilities). Participants could respond on-line for purposes of dialog, and could also respond to research surveys such as the questionnaire shown below, for subsequent analysis, summary and dissemination on a global basis. This would make possible an entirely new and radically participative approach to research and communication on "What Future Generations Need From Us." If it happens, I venture to forecast that the needs of future generations will fare much better than they otherwise would. What I Experienced in the Visualization Exercise on "What Future Generations Need from Us"
Bry, A. (with M. Bair) Visualization: Directing the Movies of Your Mind (NYC: Harper & Row, 1978). Galyean, B. Mind Sight Learning Through Imaging (Long Beach, CA: Center for Integrative Learning, 1983). Markley, 0. "Using Depth Intuition Methods for Creative Problem Solving, and Strategic Innovation," The Journal of Creative Behavior (Vol. 22, No. 2, 85-100, 1988). Reprinted as Selection 40 in S. Parnes, Ed., Source Book for Creative Problem Solving: A Fifty-Year Digest of Proven Innovation Processes (Buffalo, NY: Creative Education Foundation Press, 1992). Vaughan, Frances, Awakening Intuition. (Garden City, NY: Anchor Books, 1979). Tough, A. "What Future Generations Need From Us," Futures, December, 1993, pp. 1041-1050.